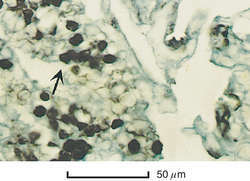 a form of pneumonia characterized by lobar distribution of the consolidation of the serofibrous fluid exuded by the alveoli. The condition results from infection by a virulent type of Streptococcus pneumoniae. The onset is sudden. Symptoms include pleuritic chest pain, dry cough, and rust-colored sputum.